The Arts Council is proud to announce the kickoff of the 9th Annual Sculpture WalkAbout! 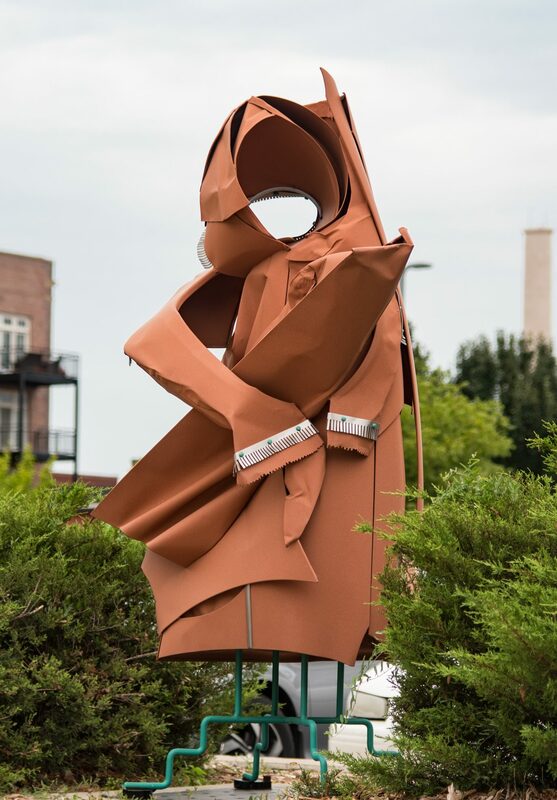 Inspired by past Wichita Mayor Carl Brewer and local arts supported Dora Timmerman-Bayer, the Sculpture WalkAbout is a yearlong exhibition that showcases the work of the region’s premier three-dimensional arts. 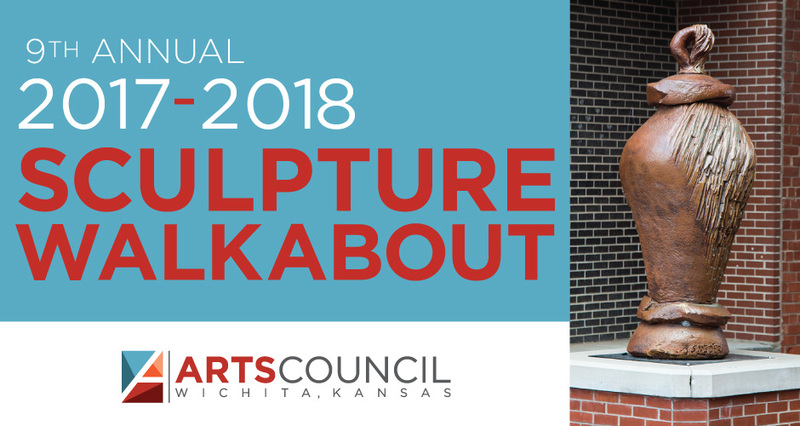 The Sculpture WalkAbout is overseen by the Arts Council WalkAbout committee in conjunction with the City of Wichita and Sedgwick County, and with the generous support from private sponsors. Ed Langston was born in Pampas, Texas in 1947, moving to Wichita Kansas at age 5. He attended Wichita state University and majored in graphic design and then sculpture. 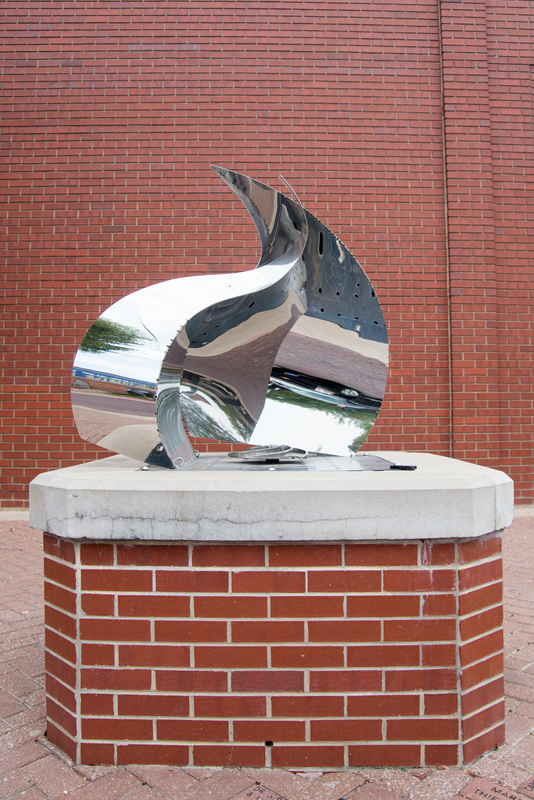 Bernie’s Bird was inspired by Senator Bernie Sanders, and is a very stylized, conceptual version of a bird from one angle, and a flame from the opposite angle. It’s handcrafted from stainless steel, and uses Kevlar to hold the pieces together in place of the usual technique of welding the pieces together. The individual pieces of the work are cutout from a computer-controlled waterjet cutter. Langston has two installments on display. Ed Langston, Bernie’s Bird. Stainless Steel & Kevlar, 4’ H x 3’W x 3’D. Sam Shoffner has been making and welding things for people since the ‘60s. He has designed and produced tools, handicap ramps and accessories, mountings and brackets, trailers, parade floats and so much more. Shoffner says his involvement with Art Aid led him to make several pieces for other fundraising projects and things for people in need to use. 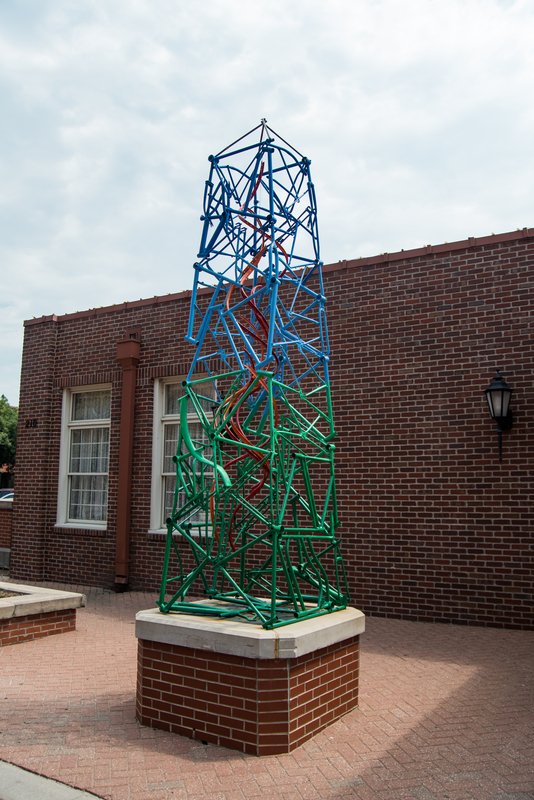 Shoffner’s steel installment, “Titan II” is on display Downtown. Sam Shoffner, Titan II. Steel Parking Light Post, 20’H x 18’W x 18”D. 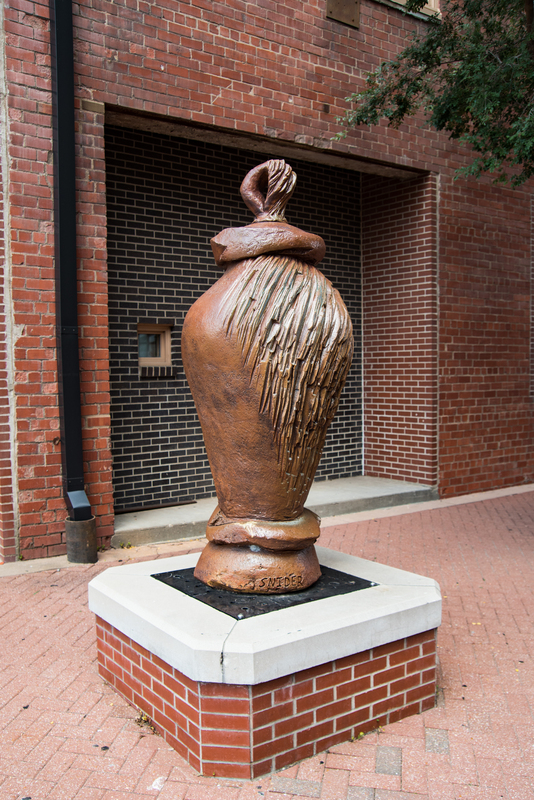 Marc Durfee, Art Director at the Derby Recreation Commission, was born in California, and received a Bachelor’s Degree in Ceramics from Southern Connecticut State University, and a Master’s of Fine Arts in Sculpture from Wichita State University. Durfee is a vintage luggage collector and enthusiast, who has always been interested in travel and the containment of history. He wonders about the people, places, and thing the luggage has seen and/or experienced. Durfee has three installments on display. Marc Durfee, Bike-elisk. Welded Steel, 12’H x 3’W x 3’D. Conrad Snider has worked toward developing an understanding of clay as a material. It’s his desire to limit the visual residue of his hand, allowing the clay to have a dominant voice. The scale of his work forces humans to look at how they relate to the world around them, and to question their sense of entitlement. When an object is the size of a human or larger, Snider says it requires the viewer to walk around it and take on the role as a temporary equal. 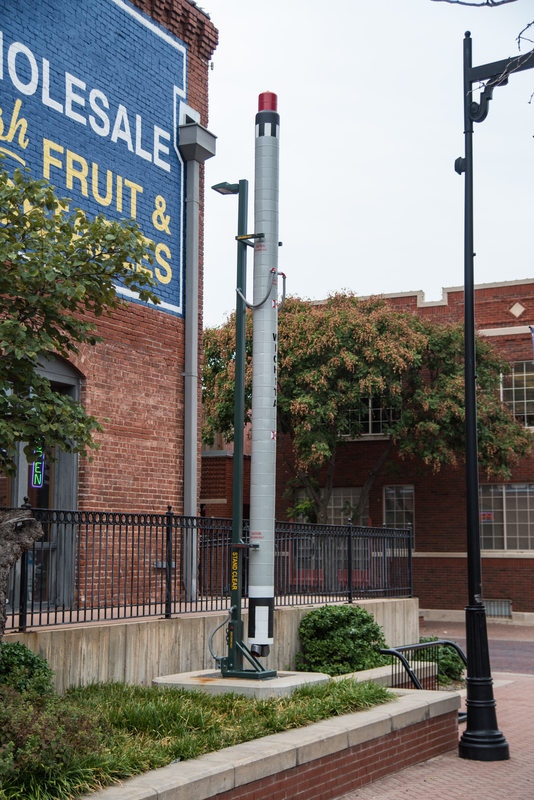 Snider has two sculptures on display in Downtown Wichita, as well as public commissions for Wichita, Newton, Salina, Hesston, and Garnett. Conrad Snider, Sunrise Bottle. Clay, 5’H x 3’W x 3’D. Rollin Karg said it’s not easy to stick his head into a hot furnace and burn the hair off of his forehead, but it’s in his nature to take on challenges like this. He loves the feeling of accomplishment when he works hard on a piece, and it comes out looking right. For a truly one-of-a-kind piece, he’s created metal bases to house and enhance the glass that creates a unique and architectural feel. He has been working with glass for over 50 years, and says he’s still learning. Karg works out of Kechi, Kansas, and has received more than 40 awards for his work. Karg has four pieces on display. Rollin Karg, Faith’s Flight. Stainless Steel & Glass, 12’9”H X 43”W x 52”D. creation of sculpture. He believes creating and repairing are parallel with very different outcomes. Johnson has two pieces on display at the WalkAbout, but you can also catch his work around Wichita. 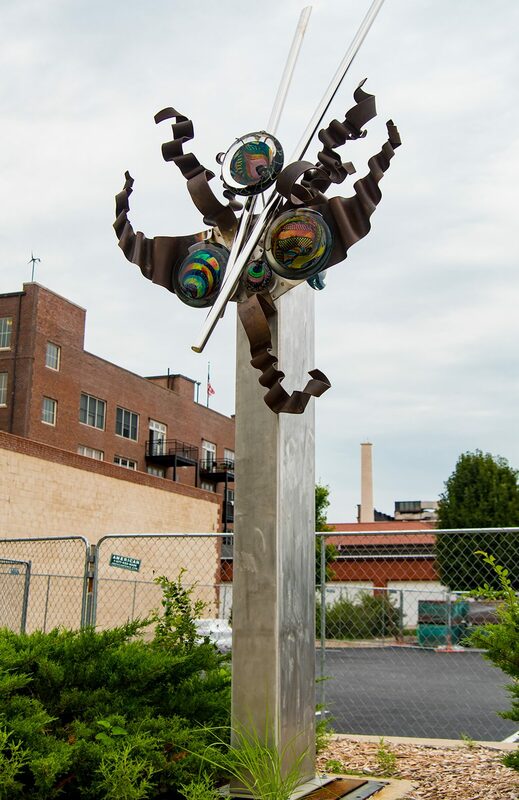 The outdoor piece that he’s most fond of is “Mosquito Mohawk,” the giant dragonfly at Botanica’s Children’s Garden. Greg Johnson, Chomamma. Steel, 6’H x 3’W x 3’D. Check out more information, including a full list of sculptures and a map to navigate the Sculpture WalkAbout this Final Friday!